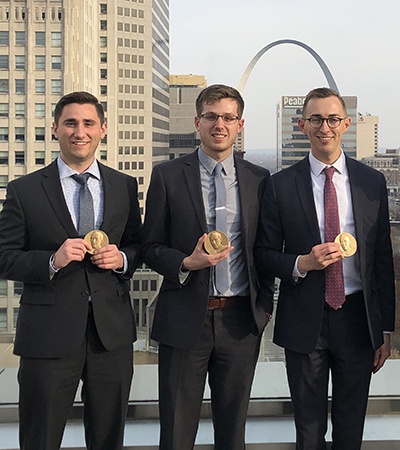 3Ls Paul Henderson, Nathan Klein and Chris Page defeated a University of Kansas team to win to Region 9 competition of the New York City Bar Association’s National Moot Court Competition. The team, coached by alumnus Shannon Doering, ’99, will advance to the national competition finals to be held in New York City January 21-28, 2019. A second Nebraska Law team comprised of Adam Kost, Maureen Larsen and David Shea also made an impressive showing at the competition, advancing to the semi-final round before they were defeated. The following teams competed in the competition, which was hosted by Saint Louis University: University of Arkansas – Fayetteville, University of Arkansas – Little Rock, Creighton University, University of Kansas, University of Missouri – Kansas City, University of Missouri – Columbia, University of Nebraska, Oklahoma City University, University of Oklahoma, Saint Louis University, University of Tulsa, Washburn University, Washington University.